Pep Guardiola’s Manchester City have received a major boost as Sergio Aguero, Kyle Walker and Benjamin Mendy returned to training ahead of their Champions League quarter-final first-leg clash with Tottenham on Tuesday night. Aguero sustained an injury in his side’s Premier League win over Fulham few days ago, while Walker was taken off at half-time during City’s FA Cup semi-final 1-0 win over Brighton last weekend and Mendy had a long-term knee problem. 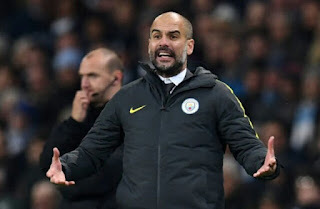 Speaking ahead of Man City’s Champions League clash with Tottenham, Guardiola told the club’s official website that the trio will be assessed after this afternoon’s open training session, but believes they should be fit enough to face Spurs. “Aguero feels better. He trained with the team for the first time and he feels better,” Guardiola said. “Now we will train. They make a recovery. “Kyle feels better, we will see now [how he is], and Benjamin recovered well.